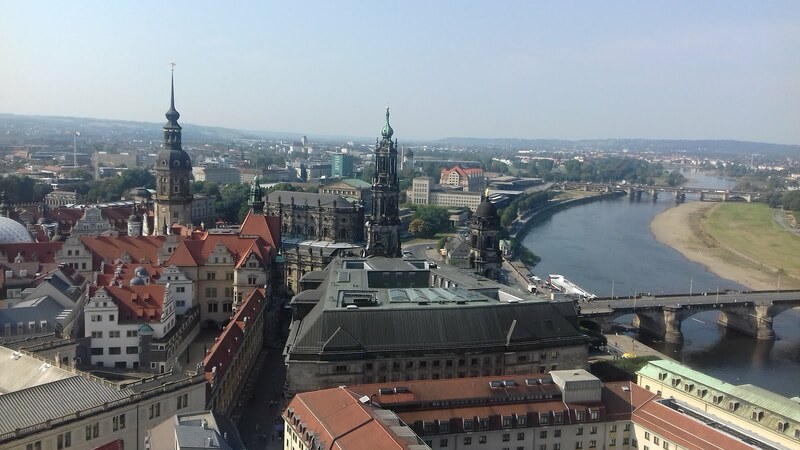 The campsite that we're staying on for the next few days is on the outskirts of Dresden in an area called Mockritz, so it has provided an excellent base from where we can catch the tram into the city to see the sights. 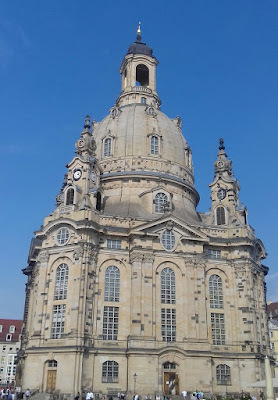 Dresden, is said to be one of Germany's most beautiful cities, and can boast of a long cultural history related to it's galleries, museums theatres, and magnificent buildings, however, almost all of these were completely destroyed during the night of 13th/14th February 1945 when British and American air forces mounted a vast carpet bombing raid on the city. 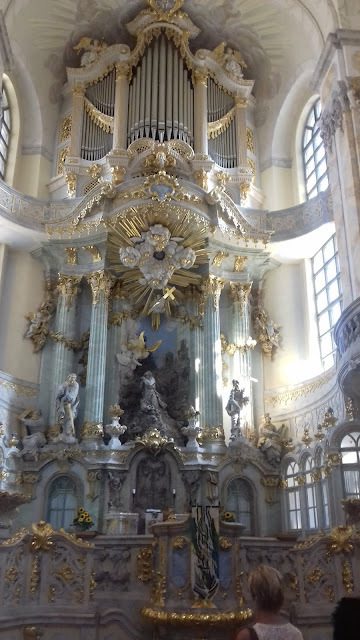 Now, many have been restored to their initial splendour, but as we explored we found quite a lot of building/restoration work in progress - possibly as a result of extensive flood damage in 2002. 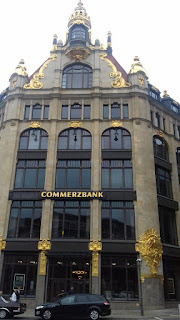 Happily, most of the sights that we wanted to see were clustered together in the old town on the bank of the River Elbe, so it was relatively easy to get around them all in one day. 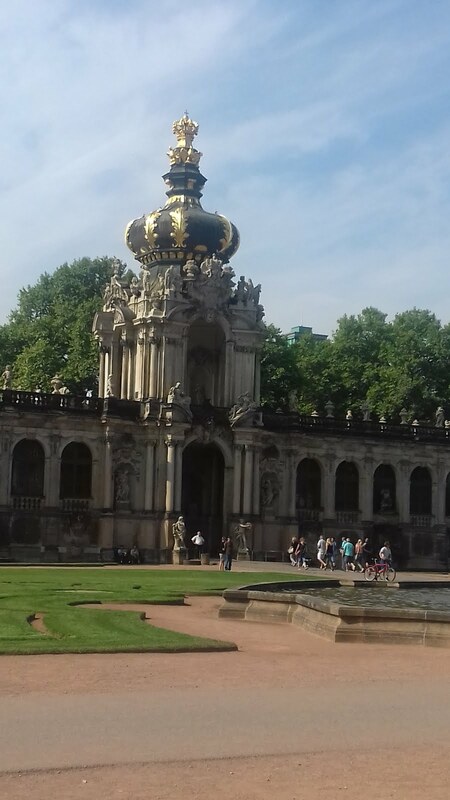 We started at the Zwinger, apparently one of the most famous buildings in Dresden. 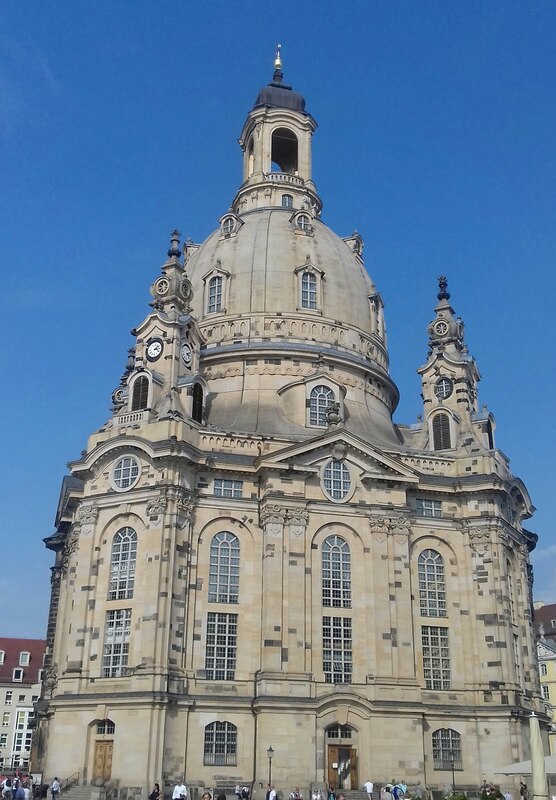 This Baroque structure was originally built in 1709, and has a beautiful inner courtyard that is filled with fountains and is surrounded by ornate pavilions and magnificent gateways, all of which are decorated with intricate statues and sculptures such as Hercules who sits proudly on top of the main Wallpavilion. 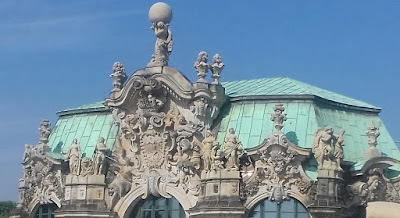 The Zwinger itself is free to enter but the pavilions charge entry fees to visit their collections which include intricate porcelain at the Porzellansammiung, scientific instruments at the Mathematisch Salon and fine art at the Galerie Alte Meister. All of the above took quite a while to explore but we still had a little time before lunch so we joined the huge numbers of other tourists in admiring the River Elbe where we walked along the Bruhlsche Terrasse - a promenade that was once part of the town's fortifications. 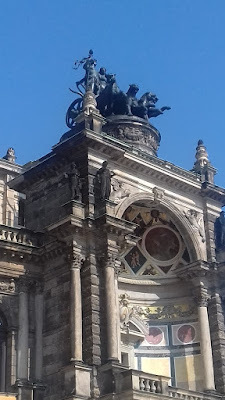 Our wanderings also took us past The Semperoper - an imposing opera house which is topped with an impressive chariot drawn by 4 rearing horses, and past the hugely ornate Hofkirche - the Catholic Cathedral church. 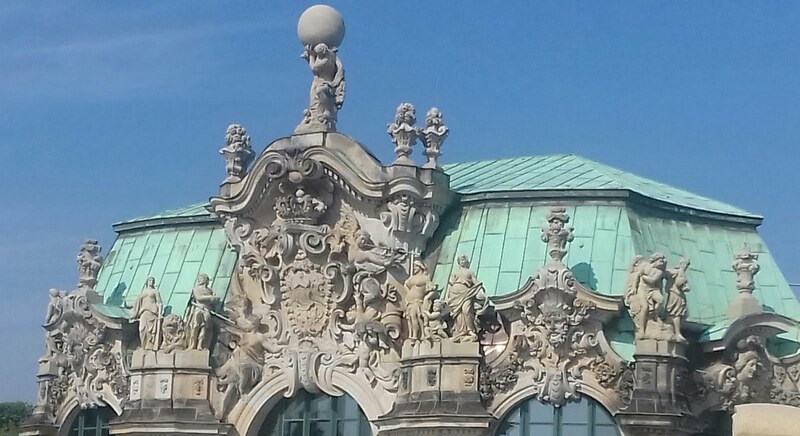 And magnificent as all the buildings were, we eventually become a little distracted by our rumbling tums! We'd decided to treat ourselves and eat out, but the choice was a little overwhelming with every sort of cuisine on offer in the hundreds of cafes that spilled into every street as well as the main square. In the end we opted for an Italian looking place that overlooked the main precinct, where John sampled the Fettuccine and I had the Cannelloni - both of which were absolutely delicious. 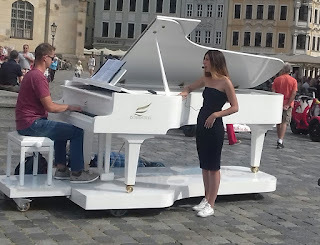 And our meal was make all the more enjoyable by the buskers - a chap who sang ballads in English accompanied by his guitar, and a lady who sang opera accompanied by a grand piano on wheels. 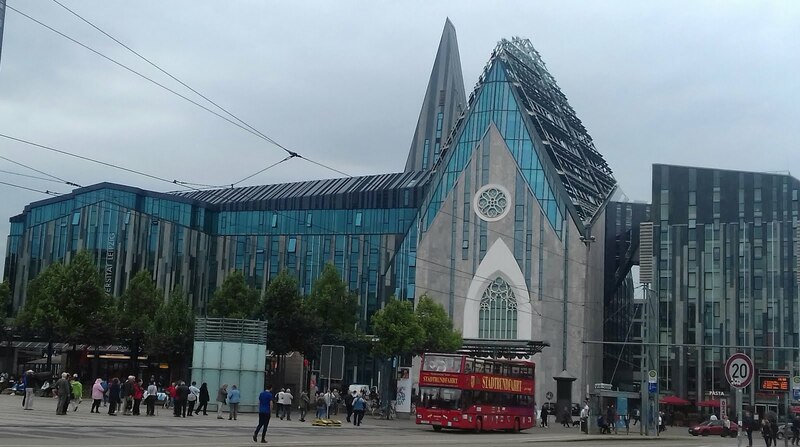 wasn't completed until 2005 when the new church was consecrated. The first part of our visit was to the inside of the church where we admired the lovely ornate alter and organ, and also gazed up into the dome that is covered with beautiful fresco paintings, and it was then that we decided our visit wouldn't be complete without making an ascent up into the tower from where we would have 360 degree views of the city. 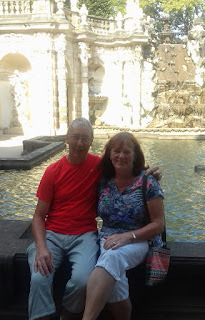 However, as we went to pay our admission fee I wasn't sure whether to be pleased or insulted - the cashier laughingly asked if we qualified for a 'concession' - were we more than 65! I denied it but I'm not sure if it was lost in translation, cos he only charged us the cheaper rate! 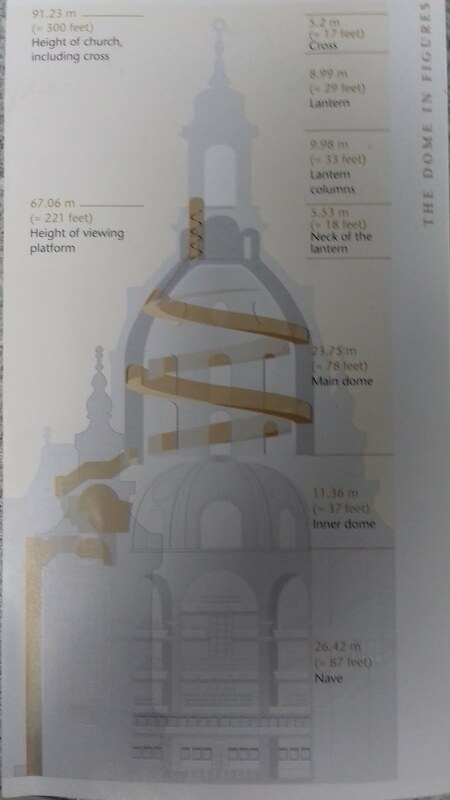 Anyway, to get to the viewing platform we climbed over 200 steps, we passed along 162 metres of spiral ramp at a gradient of 14%, and finally, we climbed a steep ladder that led onto the balcony - and it was all well worth it for the enjoyment of our birds eye view over the city. Eventually we tore ourselves away and were soon back down to ground level, but by then we were well into the afternoon and starting to feel a bit weary. Therefore, we only spent a little more time exploring the fair/market area before we headed back towards the tram that would take us home. And it was once we were aboard that we realised we had inadvertently only purchased children's tickets from the machine when paying our fare - on well, maybe it was our day for 'concessions'! Saturday 17th September 2016 - A wet day - with heavy rain at times! But we knew it was coming - so last night we'd decided we would just stay put and get the washing done! However, the rain only really lasted for the morning, and the forecast was for it to get better again after the weekend so we really don't have anything to complain about. 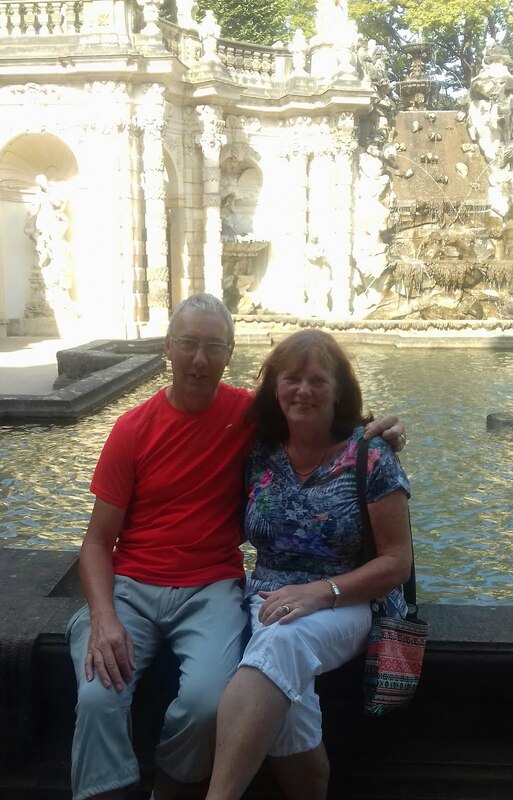 And the only other thing worth mentioning was John's 'funny' experience with the shower! On this site you have to put tokens in a meter and then you are provided with about 4 mins of hot water. John duly put his token in, soaped up - and after 45 seconds the water dried up! Never mind he thought - I've got a spare token so he popped it in - and nothing, not even a dribble. So there he stood - all soapy and not a drop of water to rinse with - it's such a shame it had stopped raining! Sunday 18th September 2016 - Drizzly rain to start, cloudy but dry after 11am. This morning we packed up in the rain and left our campsite at Mockritz with a plan to visit Colditz Castle and then drive on to Leipzig where we thought we might stay the night before exploring the city sights tomorrow. However, as often happens, the second half of our day didn't go quite as planned! 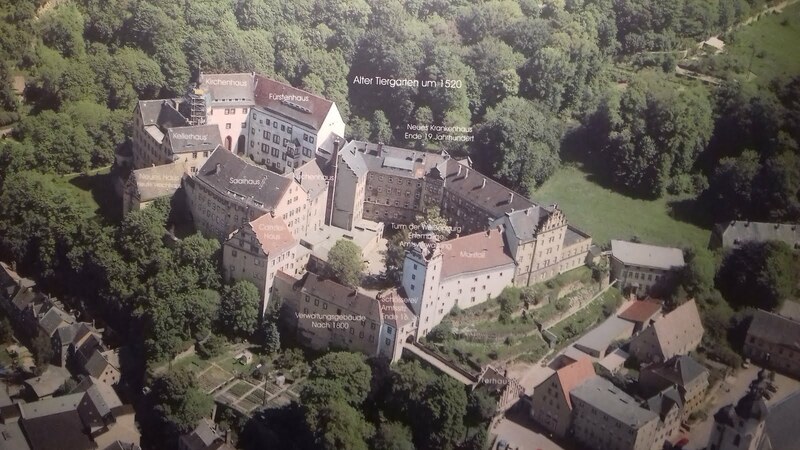 But I'll tell you about Colditz first! The castle can trace it's history back to the 11th century, but since then it's burned down twice, it's housed royal guests, it's been a 'poor' house and both a mental and general hospital. However, what most people would remember it for was it's time as a high security prisoner of war camp in World War II. 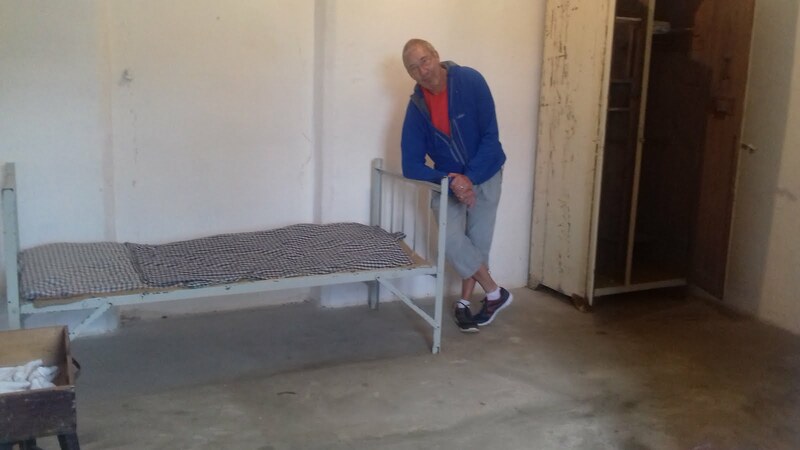 We learnt that it mainly housed Officers who had made previous escape attempts form other prisons, and that although the German Officers considered it to be 'escape proof' it had one of the highest records of successful escape attempts. The buildings themselves were quite drab and unwelcoming, and although a few rooms had been 'left' to demonstrate what conditions might have been like, the images weren't very impressive. However, one room did have paintings and essays from inmates that described their daily activities, and also indicated how their own 'black market' thrived with prisoners using items from their Red Cross parcels to buy information and tools from cooperative guards! Following our visit we headed back to the car park and met up with another English couple - the first we have seen since we left Sharon and Paul over 3 weeks ago! So of course we paused for a natter before continuing on to our planned Stellplatze at Leipzig, but as soon as we pulled in we just looked at each other and agreed we wouldn't be staying there! The area was quite scruffy and the surrounding walls were covered with graffiti, and added to that, it just didn't feel 'right'. However, luckily John had programmed a second back up spot into the sat nav so we thought ' oh well, we'll just go there' - but that wasn't much better. So plan C had to come into action. 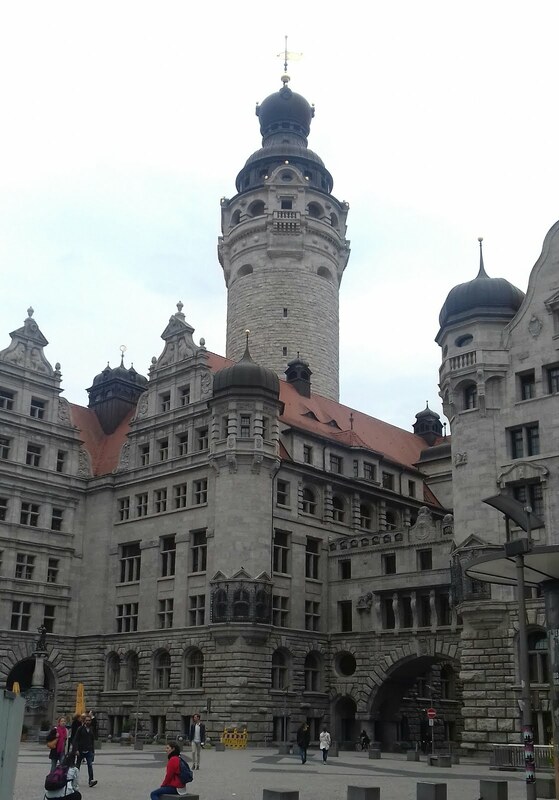 By now it was about 4pm so we decided we'd just go for a quick look at the main sites of the city and then move to a Stellplatze on the outskirts of the town. So, we started our whistle stop tour by heading into the old town - but really, it seemed to be a case of old and new nestling side by side in complete harmony. The first thing that caught our eye was the futuristic University Building, and then our wanderings also took us past the Gothic Neues Rathaus (the town hall), the gold clad Commercial Bank, the newer Grand Opera House and St Thomas's Church to name but a few. 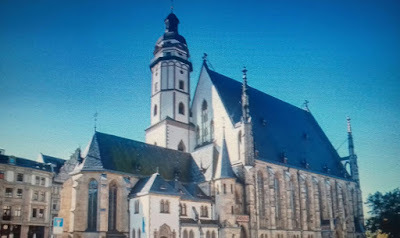 We also found 'The Music Trail' with it's signposted route around the city with the claim that 'nowhere else in the world can you find the historical sites where so many famous composers and musicians lived and worked in such close proximity' It suggested visiting churches where Bach's works were first performed, the house were Felix Mendelssohn lived and died, the home of Schumann, The Music Museum that houses the world's oldest piano, and of course the Opera House. Sadly, we didn't have time for any of the above - maybe next time. Monday 19th September 2016 - Overcast to start but cleared to give sunny periods in the afternoon. Happily, the third Stellplatze that we visited yesterday came up trumps and we spent a quite and comfortable night in it's confines. Then this morning we headed off for Worlitz Park in the the state of Saxony-Anhalt, a place that we'd almost come across by accident in our guide book, but one that proved to be a little gem. The park was described as 'a charming English style landscaped garden - the first of it's kind in Europe.' 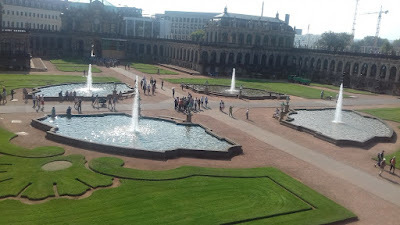 Apparently, it was started in 1764 and was contributed to by numerous gardeners and architects - and the end result is a garden that is dominated by 3 large lakes that are all interlinked by canals and floating bridges. Additionally, there are a large number of 'follies' hiding within it's grounds and many of these were unusual to say the least! And right at the beginning of our visit I think John thought I was deserting him! A very friendly non-English speaking German gentleman took me by the hand, and while John was looking at the map, he led me off into the park. In the end I don't think I'd pulled - he just wanted to make sure we knew there were lots of cycle tracks! 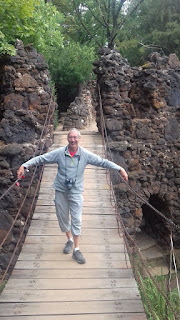 To name but a few we came across a swaying chain link bridge - Kettenbrucke - with old wooden slates - John nearly made me fall in when he made it wobble! We found The Venus Temple where a naked lady stood on high and where we could enter the cavernous cave like structure underneath. And we found a volcano - a replica of Mount Vesuvius. The information said it rumbles and drones before clouds of smoke ripple our of it's crater with a load roar, fumes ascend and flames flare up into the sky - but not on Monday's - so we just had to use our imagination! 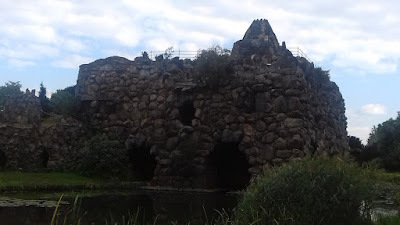 The park really is a wonderful place and one I would strongly recommend if your ever in the area - but be warned - wear comfy shoes cos it took us about 5 hours to walk around it's huge grounds. It took us so long, because apart form the distance there were loads of other sights to see, and even more in the summer when they have classical concerts on the lakes and the audience attend in boats! 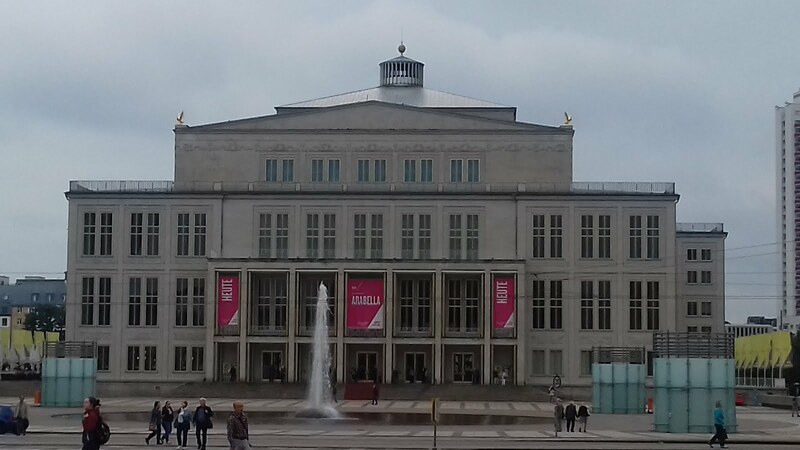 While we were visiting there was no music but we had the pleasure of lots of other things. 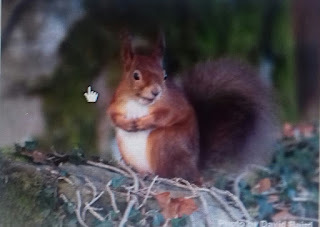 We watched several red squirrels nipping about collecting their stores for winter, along with herons and other water fowl and loads of fish leaping out of the water to catch their tea! The trees were also changing the shade of their leaves - and that, along with the nip in the air in the evenings is a sure sign that Autumn will soon be here! Eventually, we tore ourselves away form the park and had a stroll through the village - and there we found another beautiful site - St Peter's Church - a very unusual and intricate red brick building that unfortunately was 'closed on Monday'. 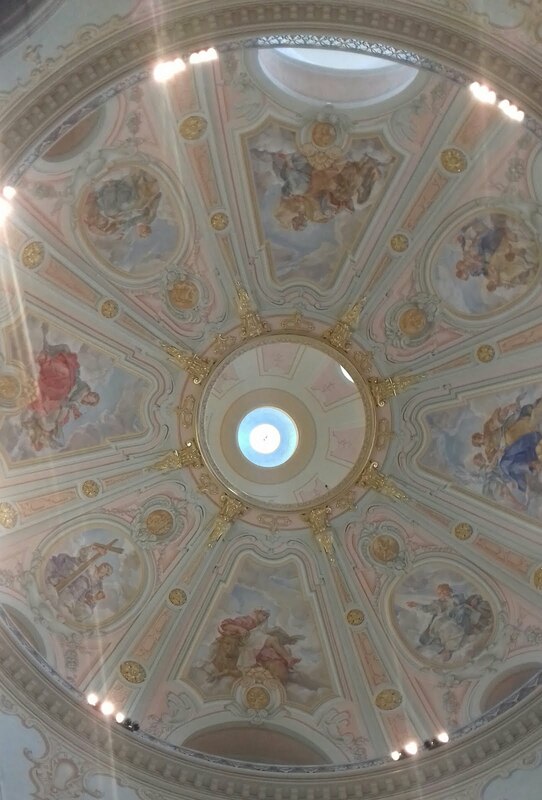 However, that didn't stop us admiring it's graceful lines as it soared heavenwards, and everywhere we looked we spotted fantastic works of art in it's construction. Finally, foot sore and a bit weary we headed back to T4rdis2, but we don't need to travel on anywhere else because there is a very pleasant Stellplatze on the edge of the car park that will do very nicely for tonight.